The Moxon Magazine is published in April and in October of each year, and is one of the benefits of Membership which also include access to downloads of every issue from Number 1 of April 1998 to the current issue, as well as a topics index and a full index. Examples are available to inspect at the foot of this page. 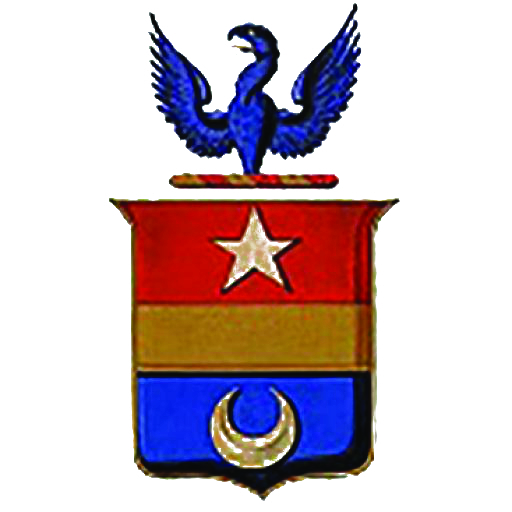 The first meeting of what is now an Annual Gathering, was held in Oxford in November 1987. Delegates took note of the publication earlier that year of “The Moxons of Yorkshire” which had been compiled and edited by James (‘Jimmy’) Moxon: more than 300 copies had been received by foundation subscribers, libraries, societies and friends. It was suggested that the nascent Moxon Society (the Society was formally created on 1st January 1990) should have a newsletter, and the task of editing it fell inevitably to the indefatigable Jimmy. 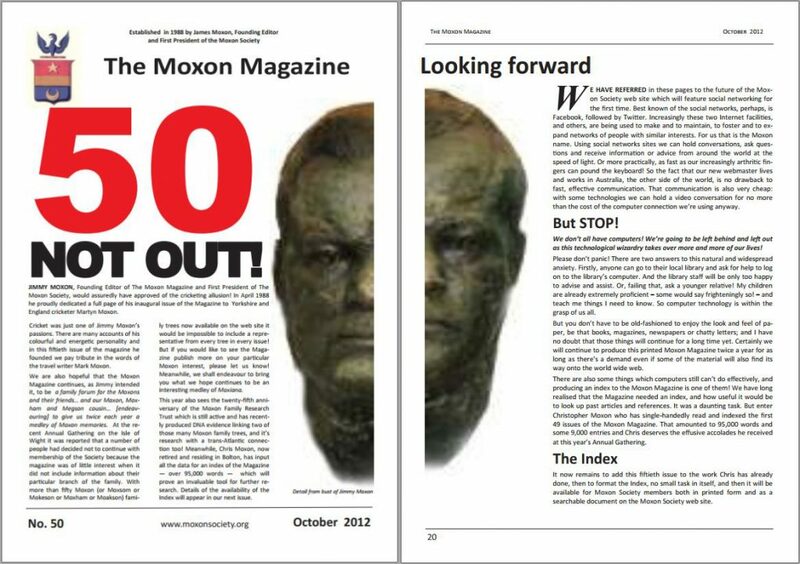 The Moxon Magazine was the result, a journal, in Jimmy’s words, to be a twice-yearly publication to “ensure a regular flow of the results of continuing Moxon research and of Moxon news, correspondence and feature material.” It has been circulated to all members without a break since then. James “Jimmy” Moxon OBE, MA, FRGS, the first Editor, was a very colourful character whose personal tales of derring-do were perhaps not told as often in the Magazine as his exploits deserved, but enough were reported to give a clear idea of the man and his Moxon mission. He continued to edit the Magazine until April 1999. He died in August 1999, his obituary carried in the next issue under the new Editor, John Moxon Hill, another co-founder of the Society. John Moxon Hill’s tenure of the Editor’s desk stretched from issue 24 in October 1999 to issue 45 of October 2010. John died in August 2010 and having been his assistant for three issues I assumed the privilege of the Editor’s Chair with issue 46. In 2012 Christopher Moxon generously undertook the long overdue and very important task of producing an index to the magazine which, as well as being “twice a year a medley of Moxon memories,” had become a valuable resource for Moxon Family researchers. The full story can be read in the introduction to the Index to issues 1 – 50, the paperback version of which is still available at www.lulu.com for £9.99. More recently it was felt that researchers, and particularly Tree Guardians, needed a way of electronically searching more of the huge archive of Moxoniana, and so a new website came into existence. It includes an electronically searchable version of the Magazine Index, courtesy of the continuing hard work and dedication of Christopher Moxon and of Philip Lord. That Research website is accessible to Members only. 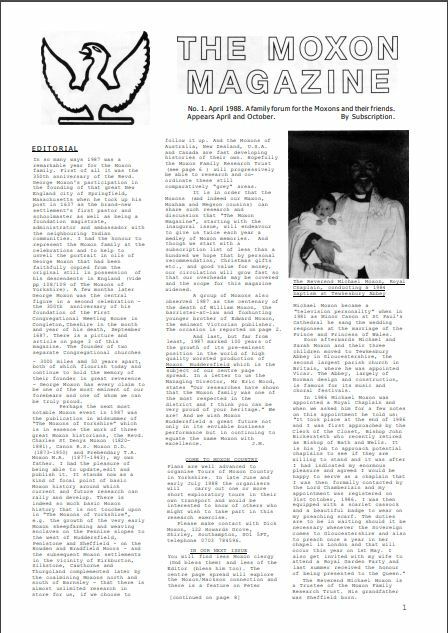 All issues, from number 1 of April 1988 to the current issue are downloadable on the Moxon Family Trust Research website, accessible to Members, but to get a flavour click the cover of Issue 50 to read a few examples of our stories. The Editor could not resist the visual pun of splitting the photo of our Founder's bust between front - looking back - and back - looking forward - covers for the 50th issue!